There are days when I cook, chicken curry, lal maas, chingrir jhaal and then there are days when I have bag full of Bhindi staring at me from the vegetable tray. Believe me I need a lot of inspiration to cook bhindi. Not particularly a fan of this lady finger. I remember this was about a couple of years back at work, one afternoon when we all sat down for lunch, those days we use to carry our own dabbas (lunch boxes) 5 of us and believe me all 5 of us had bhindi ki sabzi and roti for lunch, you can understand my plight, every lunch box I look into had these green long things or green tiny things, staring at me and at that point , the roadside chole kulche wala seemed more inviting than ever. So that was then, last evening when I opened my freezer to cook, it was right there staring at me, sense of deja vu, I was almost tempted to pick up the phone and do a takeaway. But then I decided to face my fears, or more like my disgust, hate, aversion and picked up the bindi. Fine then were in my hand, the slimy, pricky long things, what am I to do next, what do I make. No matter what I cook I am never doing to learn to like bhindis, let alone love. In fact this is one place where my ma and I totally agree, ma says in bengali (dharosh abar ekta shobji abar taar pechoney ami shomay noshto korbo, oita baki aache) what she means is I am not going to waste any time on bhindi , it is such an insipid vegetable. In Bengali cuisine, bhindi miserably fails to make it to the higher echelons and rub shoulders with the likes of mocha, echor, pui shaag. 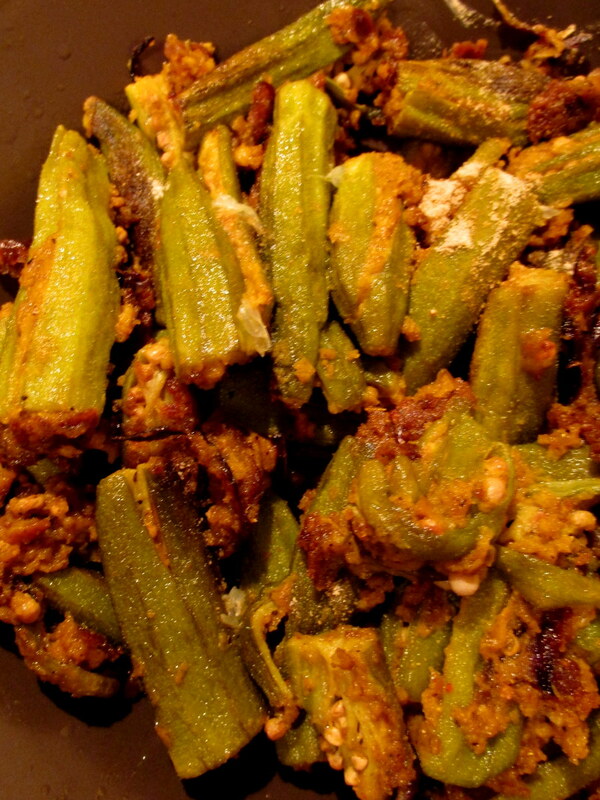 For Bengalis, bhindi is also there kind of thing and at most they will do a side dish of okra boil or okra fry, nothing more, no extra effort to go into it. When you grew up in Delhi you know how sacred and important bhindi is to this part of the country and they would go great lengths to cook it. Since, I do not like bhindi and yet, I had to eat that for dinner (sorry state of the vegetable tray, didn’t do the groceries, my fault) , I had to make an effort to cook this thing. So I decided why not make bharwan or stuffed bhindi, one of the tolerable recipes as far as bhindi is concerned, I might just be able to swallow it down with the rotis. Yeah I know I really don’t like this vegetable..
Wash the bhindi and then dry it completely with paper towel. Then chop of the head and little curved tail section of the bhindi. Next make a lenth wise slit on the bhindi , be careful not to slit them into 2 pieces. Now take the besan and all the powdered spices and mix them together along with the salt. add a little bit of water to make it onto a batter , but make sure it is not runny, the batter must be on the thicker side so that it stays put inside the bhindi pockets. 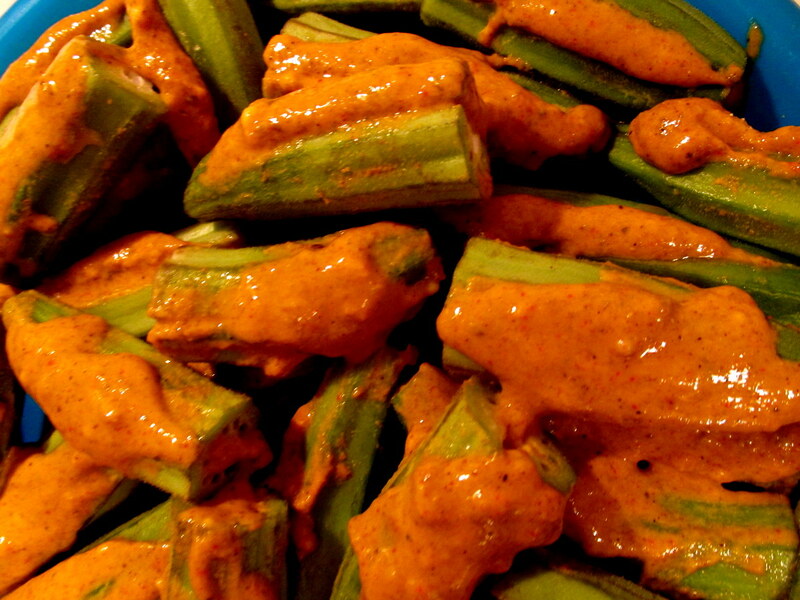 Stuff the okra with this masala. Keep the left-over masala separately. Heat oil in a kadhai or wok and saute the onions till they turn translucent. Next add the bhindis to it and cook it covered for about 15 mins on medium heat, by now they should be almost done, if you have some left over batter like I did just add it to the bhindi and cook it on high heat for about 5-7 mins. Then should be ready by now. 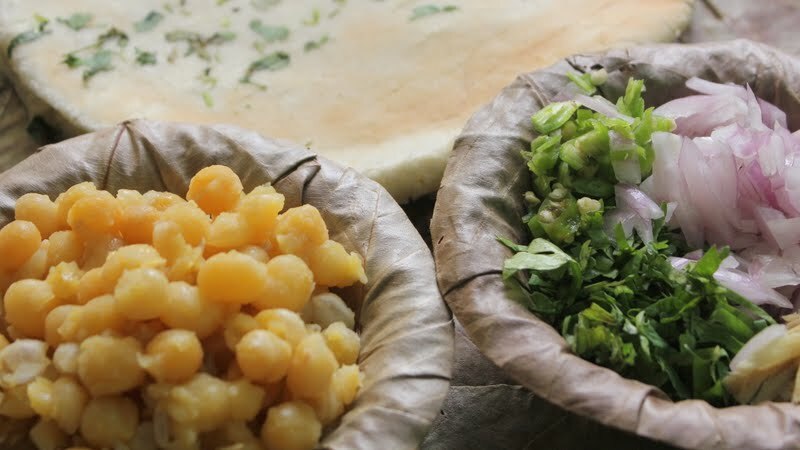 Garnish with lemon juice and rock salt and serve it with hot chapattis. 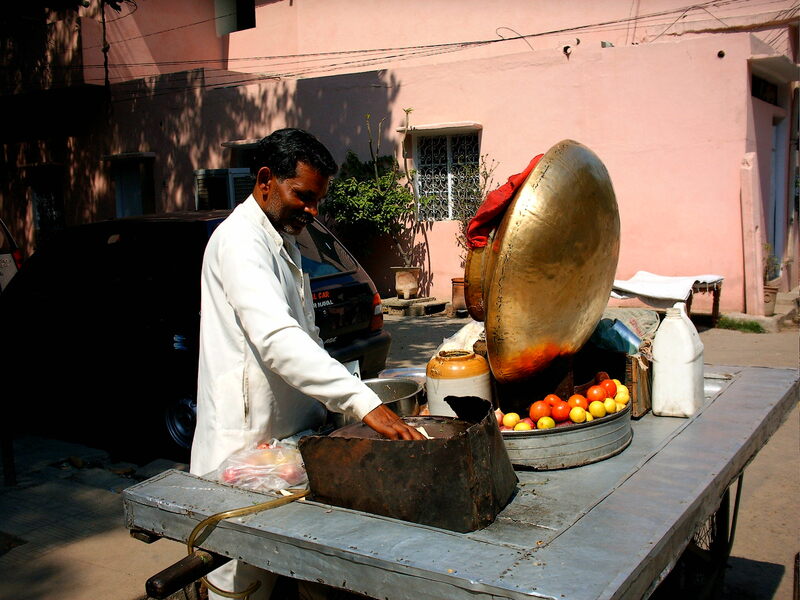 Notes : Here I must say, the bhindis did taste different and more pleasant. 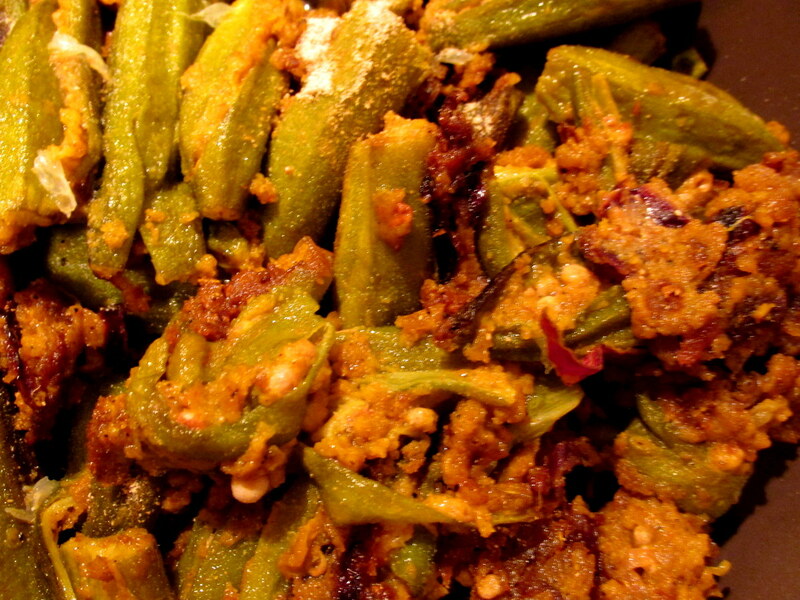 I could learn to live with bharwan bhindi ( that is a big step for me) but when I was discussing this recipe with my mum, her opinion on bhindi had not changed and her response was when you visit me or when I visit you, you can make it for me, but I am not going to spend so much time on Bhindi… Sigh…..
e}. it might help u overcome yr disgust for this poorly creation by the all mighty… 😉 [bhogoban nishchoi bou’er shaathe jhogra kore bhindi ta ke conceptualize korechilen]….